“The King is dead. Long live the King.” In Britain the passing away of the old monarch and the advent of the new, is heralded by these words. In Sri Lanka, Wijithamuni Zoysa, Member of Parliament, echoed these same thoughts, in somewhat cruder terms in his infamous “Appachchi Mala” speech. After the Parliamentary Elections, the speed at which scores of Parliamentarians from the Sri Lanka Freedom Party switched their allegiance from the former President Mahinda Rajapaksa to President Maithripala Sirisena marks a new low even for politicians in Sri Lanka. Gone are the days when politicians at least kept a decent interval and in the very least offered some excuse when switching sides. Today no interval is necessary and no excuse offered. As for President Sirisena, he has now regained substantial control over the machinery of the Sri Lanka Freedom Party, which perhaps just over a month ago had side-lined him or as some claim was on the verge of removing him as party leader. The day was saved only by an order from the District Court. Hours after the Parliamentary election it was clear that many of those who were on the Rajapaksa camp including Susil Premajayanth and Anura Priyadarshana Yapa had raised the white flag of surrender. So complete is the surrender that they have accepted ministerial office from the very President who just weeks ago suspended them from their Secretary posts. If ever Mahinda Rajapaksa made a mistake after losing the Presidential Elections, that was to let go of the party leadership. One reason perhaps why Mr. Ranil Wickremesinghe never let go of the leadership of the UNP even during the wilderness years. President Sirisena in his own quiet way has demonstrated time and again that he is not a push-over, some of his political moves equalling or even surpassing the Machiavellian skills of his predecessors. However despite gaining control over the party machinery, whether that same control is regained over the rank and file of the party is an entirely different question. As much as Ranil Wickremesinghe could not be written off despite dozens of setbacks in the past, it would be equally naïve to assume that Mahinda Rajapaksa or his political legacy has come to an end. Within the vast majority of UPFA supporters, Mahinda Rajapaksa lives on. Now that President Sirisena has shown an appetite for remaining in party politics, his political success will depend on his ability to either win over the Rajapaksa camp or his ability to wean the party voters away from them. 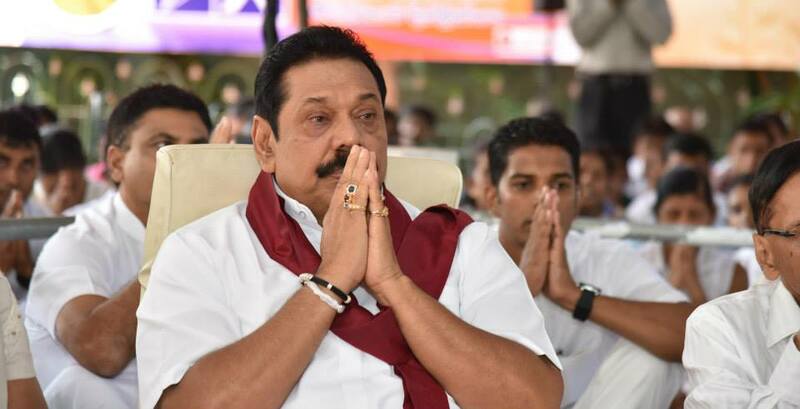 Despite the camaraderie shown at the swearing in of the Prime Minister and at the SLFP anniversary this week, it is difficult to believe that the rift will be completely healed as long as Mahinda Rajapaksa remains in active politics. The months to come will see further developments in the tug of war within the UPFA and SLFP. That half of the SLFP Parliamentarians abstained from voting for the resolution increasing the Cabinet of Ministers shows the challenges that the President will have in his bid to stave off a permanent split in the party. If President Sirisena is able to rally the party around him and to fend off the Rajapaka challenge, then when the period of the National Government comes to an end, the biggest challenge to Ranil Wickremesinghe and the UNP will be from the rejuvenated SLFP led by Maithripala Sirisena. The next Parliamentary elections in 2020 could well be a Sirisena v Wickremesinghe election, especially if the Executive Presidency is totally abolished by this time. In such an eventuality the possibility of Maithripala Sirisena returning to Parliament in the Prime Ministerial form cannot be ruled out. Such a move will also see a realignment of political forces once again. The next few years will see political manoeuvring between the two centres of power- Maithripala Sirisena and Ranil Wickremesinghe as each leader seeks to position himself, to finally perhaps face each other the day when the national government comes to an end. While this eventuality may seem strange to many of us in Sri Lanka, this is not unusual in countries with national or coalition governments. David Cameron and Nick Clegg sat in the government as Prime Minister and Deputy Prime Minister even as they battled it out at the hustings in 2015. In 1945 after five years of National Government, Prime Minister Winston Churchill and Deputy Prime Minister Clement Atlee faced each other at the General Elections and Churchill was buried in a landslide. The unprecedented delays in appointing the Cabinet of Ministers reflect this intricate balance of power and power play within the new regime. It is in the face of this future challenge that Prime Minister Ranil Wickremesinghe should seek to build the second tier of his own party and broad-base his support within the UNP. On the 23rd of July 1977, when Prime Minister J.R. Jayewardene was sworn in by President William Gopallawa, the composition of the new Cabinet itself gave impetus to public confidence. Whatever criticism that existed against Mr. Jayewardene, of his rule from 1977 to 1988 one of his greatest achievements was his ability to build up a strong team and his ability to select suitable people irrespective of his personal friendships and preferences. It is this team which helped Jayewardene to build a solid government, which paved the way for the UNP to rule for the next 17 years. When he left the Presidency in 1988, Jayewardene left to the UNP a legacy of a strong second tier of leaders including Prime Minister Premadasa, Ministers Lalith Athulathmudali and Gamini Dissanayake. The Cabinet of Ministers in 1977 saw the induction of first time Parliamentarian Lalith Athulathmudali, into the Cabinet of Ministers as Minister of Trade. The present Prime Minister himself was a beneficiary when at the age of 28 years he was inducted into the Cabinet of Ministers in October 1977, just a few months after he was appointed as Deputy Foreign Minister, as the first time MP from Biyagama. The Prime Minister continues to attract criticism over the manner in which he selects people for public office. Not everyone in the UNP camp is happy about the manner in which selections have been made to the Cabinet of Ministers, which was appointed on Friday. Some feel that these appointments reflect the perennial problem the UNP has faced under Mr. Wickremesinghe’s leadership and that once again the UNP has lost an opportunity of bringing in fresh faces to the leadership. Apart from a few new faces such as Daya Gamage, and Harin Fernando, the new Cabinet has many of the same old faces from the past- some stretching back to the 1977 government. At least three of the new UNP Ministers are septuagenarians on the verge of retirement; at least one UNP Minister was known to be on the fence during the Rajapakse regime; some were mere bystanders during the Rajapaksa era believing Rajapakse to be a fait accompli who could never be dislodged; some did not contribute in any way to the ouster of the former President. Whether some deserved Cabinet Office at all is a moot point. In contrast, left out of the Cabinet are several younger Members of Parliament who entered the legislature and energised the United National Party, waking it up from its long slumber in the opposition. Dr. Harsha de Silva, Eran Wickremeratne, Ruwan Wijewardene, Ajith Perera, Niroshan Perera were among those who worked tirelessly from 2010 to 2015 to energise the opposition and were in the frontlines against the Rajapaksa regime. There have been no serious allegations against them as to their conduct in the last few months. The inspection of various government installations and activities by these MPs during the Rajapaksa regime, their active opposition to the impeachment of the Chief Justice, their vocal criticism of the Rajapakse regime, and their pro-active participation in parliamentary and political work culminated in the successful revolution of January 8th. These MPs worked with dedication in the run up to the Presidential Elections to organise the UNP. Some of them were deeply involved with the likes of Mangala Samaraweera and Malik Samarawickrema in the effort to bring in a common candidate. They have demonstrated competence in both political and professional life at the highest level. The appointment of professionals such as Harsha de Silva and Eran WIckremeratne to Cabinet Office would most certainly have inspired public confidence in the new government. Serious questions arise as to the criteria followed in the allotment of important Cabinet portfolios. Although disaffection and resentment arising out of selections to government, would not surface right now , several years down the line these resentments may surface at the most crucial time. This is one lesson which President Premadasa had to learn just two and a half years into office as President when disaffected UNPers including the Speaker M.H. Mohammed joined in the impeachment against him in August 1991. It hardly needs to be said that it will be much easier to pull the rug from under the Prime Minister’s feet than from under the feet of the Executive President. This has happened to the Prime Minister once before. However laudable his vision may be, he must not leave room for complacency and take his party men and the voters who voted for the UNP for granted. The Prime Minister should perhaps take a lesson from the relationship between American President Abraham Lincoln and Edward Stanton his Secretary of War, during the Civil War in that country. Despite his intense dislike of Stanton, Abraham Lincoln selected him to his Cabinet because Lincoln felt he had all the necessary qualities for the position whatever his personal dislikes were. Eventually, Stanton became one of the most valuable political assets that President Lincoln had and the two established a close professional and personal relationship which lasted until Lincoln died.